One of the challenges of working in the renewable fuel industry is that people often believe that using biodiesel products requires a lot of jumping through hoops and equipment upgrades. With biodiesel, that’s just not true. In fact, getting started with biodiesel blends requires no vehicle or infrastructure modifications. Here’s what fleet operators need to know about using biodiesel. Vehicles. Biodiesel is a “drop-in” fuel, which means diesel-powered vehicles don’t need modifications to use it. All major OEMs support using biodiesel blends up to B5, meaning the fuel is 5% biodiesel and 95% petroleum diesel. 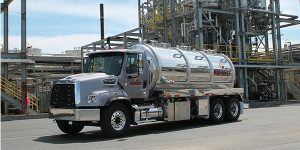 Nearly 90 percent of medium- and heavy-duty truck OEMs support B20 (20% biodiesel). Infrastructure. If you have your own fueling locations, switching to biodiesel blends does not require modifications to that infrastructure. Some fleets choose to blend the fuel themselves. This may necessitate a dedicated storage tank for the B100 and a blending system, but it often only takes months to realize a return on the investment. Quality. The biodiesel industry has come a long way since its pioneering days. Today, biodiesel meets the stringent standards of ASTM International. ASTM D6751 gives biodiesel a minimum uniform quality across the industry. On top of that, you could look for a producer who follows the voluntary BQ-9000 program, which brings additional quality assurance steps on biodiesel production, distribution and storage. Supply. Biodiesel is a mature industry, with billions of gallons produced in the U.S. annually and a robust supply chain. When picking a supplier, fleets should consider companies that can provide a full range of products, such as blended fuel, B100, renewable diesel and ULSD. Other factors when picking a supplier include how they can move product—truck, rail, ship, barge—and the extent of their terminal network. And don’t forget value-added support that goes beyond the sales team, such as logistics and supply chain management, RINs expertise and technical support. Performance. Ease of use is great, but you still need a fuel that performs, right? So what do the people who know diesel equipment best—diesel technicians—have to say?